We’re delighted to have welcomed some sunshine here on Cavendish Square this week and hope that it’s the start of the London spring season. To coincide with the warmer weather in Marylebone we have refreshed our French menu to introduce some lighter dishes, using the best seasonal produce of course. We are especially pleased with our new Octopus starter. We serve our octopus à la plancha, with vierge sauce, Iberico chorizo and squid ink. Our Sommelier, in Les 110 de Taillevent tradition, has paired this dish with 4 wines by the glass and our favourite is Ajaccio “Granit” from Domaine Vaccelli, Corsica – a great 2013 vintage. If you join us and try this pairing please do let us know what you think. Morels are in season and at their best in the spring. Chef Raph has combined their taste with scrambled eggs and green asparagus as a starter and steamed Wild Sea bass, baby artichoke Barigoule and shellfish sauce as a main course. We hope you have an opportunity to taste our morels whilst they are in season. Another pick of our spring menu must be the Calamansi Lemon with passion fruit, meringue, shortbread, tequila & lime sorbet. Pair this with a glass of Tokaji “Edes Szamorodni” from Domaine Disznókő in Hungary (2013) or try a non-wine pairing of Patron Anejo Silver Tequila. Our set menu, priced at just £20 for 2 courses has also had a refresh and has been paired with new wines, take a peak here. 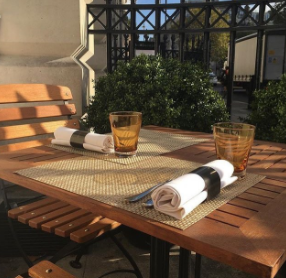 When the weather is in our favour we’ll be opening our al fresco Terrace overlooking Harley Street and Cavendish Square for lunch and early dinners. As you can imagine the British weather is hard to predict so please do give us a call in advance and we’ll let you know if it’s open and reserve you a table. We hope to welcome you to spring at Les 110 de Taillevent soon, please do book your tables below.